This is a kind of high performance HDMI Switcher. It can easily switch three sources to one display. It not only has the key-press-switching function, but also has intelligent function. 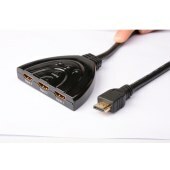 With one fixed HDMI cable (pigtail) this adapter not only reduces cost but also saves time for consumers. 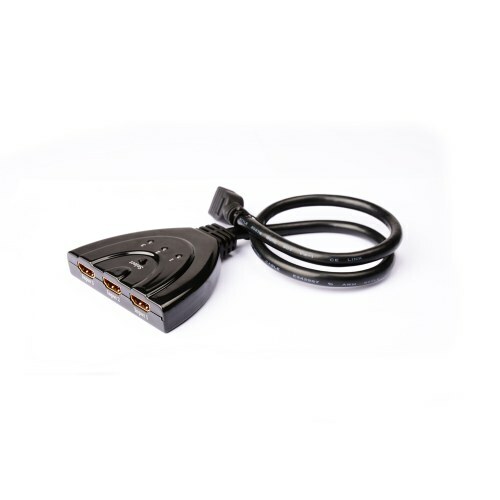 This kind of HDMI Switcher routes high definition video (in multiple resolutions up to 4kx2k) and digital audio from any one of the three sources to display units. All inputs accommodate the connections of the high definition video sources simultaneously, compatible well for HD-DVD,SKY-STB, PS3, Xbox360 etc. 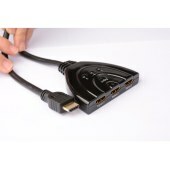 The output sends the high definition audio/video signals to a high definition display. l Supports 600MHz/6Gbps per channel (18Gbps all channel) bandwidth. l Supports 12bit per channel (36bit all channel) deep color. l Supports uncompressed audio such as LPCM.